Industries that use steel and aluminum employ 4.6 million people in the US. 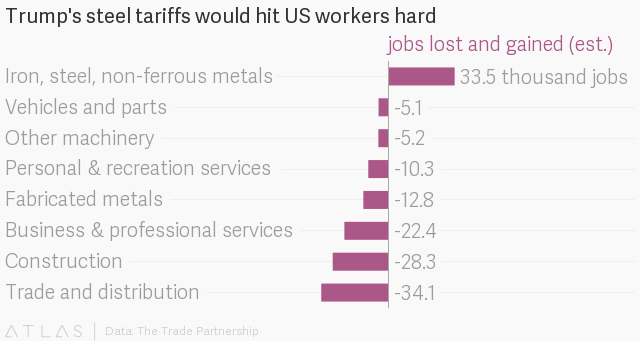 The Trade Partnership, a economic consulting group, estimated in March that five US jobs will be lost for every one saved by the proposed tariffs, or about 146,000 jobs in total. That estimate assumed the US’s partners in the North Atlantic Free Trade Agreement, Mexico and Canada, would be exempted from the tariffs. Now the losses are going to be even higher than that earlier estimate, Trade Partnership president Laura Baughman told Quartz, because the tariffs only exempt Australia, Argentina, Brazil and South Korea. “What’s most alarming now is that imports from Canada and Mexico will also be hurt, increasing consumer and job impacts beyond those we estimated last March,” she said. These job losses will be felt throughout the US, Kolko’s analysis shows, but particularly in the “rust belt” states and the deep South, including Michigan, Ohio, Indiana, and Mississippi. In 2002, president George W. Bush imposed tariffs on steel imports for much the same reason as Trump—combating cheap imports from other countries—but ended them when the World Trade Organization ruled them illegal. Over the 18 months that the tariffs were imposed, a spike in steel prices put 200,000 workers out of their jobs, according to a study (pdf) paid for by companies who buy steel. The WTO may also rule on the US’s most recent trade tariffs as well, trade specialists said today. But it took the international body 18 months to make that ruling last time, while the jobs affected could be lost much more quickly. Read more: Trump’s trade tariffs make perfect sense, if you look at the history of US trade policy.